4 images available; click on one to open viewer. Endemic to the Chalakudy River in the state of Kerala, south-western India. Apparently, it lives in the stream-like headwaters of the Chalakudy drainage. Unsuitable for tanks smaller than 48″ x 18″ x 18″ (120cm x 45cm x 45cm) – 243 litres. It’s a nocturnal species, so provide dim lighting and refuges in the form of big chunks of bogwood, tangles of beech branches, large rocks or lengths of plastic piping of a suitable bore. Ensure that any decor is either secured or is too heavy to be moved around by the fish. A large and efficient filter is needed to cope with the amounts of biological waste produced by a fish of this size. Given the fact it originates from hill streams, a good water flow with a high oxygen content would seem appropriate. Most specimens are easy to feed, accepting a wide range of dried and meaty frozen foods. Feed a mixture of dried pellets as well as frozen prawns, mussels, earthworms etc. You may need to add food at lights out to ensure it gets its share, as it can be very secretive. 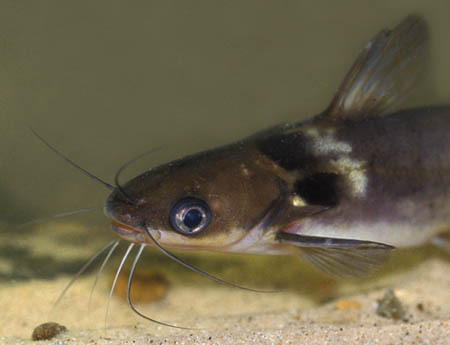 Peaceful for its size and does well in a community of other placid, similarly-sized fish. It will eat any tankmate it can fit in its mouth, so be warned. 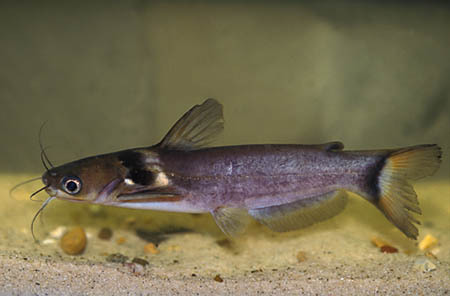 Decent choices include larger cyprininds and characins, other catfish, cichlids and the smaller species of Polypterus. It will not squabble with conspecifics and can be kept singly or as a small group. There are only 2 species currently in the genus Horabagrus, with this one being the rarer in the hobby. H. brachysoma is the other, and it resembles H. nigricollaris quite closely. It is a much larger fish and is unsuitable for most home aquaria. 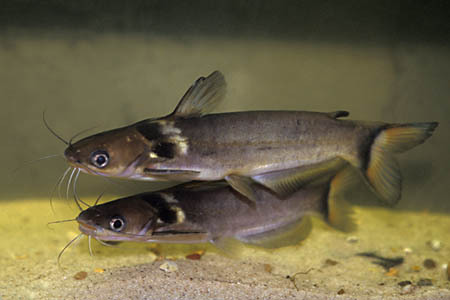 Confusion can arise as both are usually sold as juveniles, at around 2-3″ in length. They can be told apart by examining the black shoulder markings found on either side of the fish. In H. brachysoma this is no more than a vaguely circular dark blotch. In H. nigricollaris the marking extends up and over the top of the body. This gives the impression the fish is wearing a dark collar, and gave rise to the species name.